The web has a wealth of information (and misinformation) which makes it tough to filter out the noise. 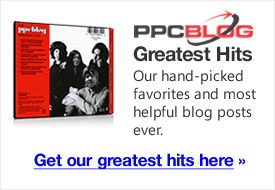 PPC is also tricky because most of the time, there are no definitive answers and everything varies. The results of campaigns are hardly the same even if a landing page is stolen and re-used. Note: There are ways to reduce web copy theft which I’ll cover next week. If you’re new to PPC and want to start out properly, you may get overwhelmed with the amount of research and execution involved. After finding your niche, keywords, keyword organization and landing page, the next objective is to determine the main sources for traffic. I see this tip shared quite a bit online. A lot of folks start with Yahoo because of its traffic converting slightly better than Google. In most circumstances, Yahoo’s CPC is lower than Adwords which is an incentive to new advertisers. The downside with Yahoo is their lower quality, spammy search partners. These are mainly domainer pages or junk, spyware infested sites. They finally allowed advertisers to exclude search partners but only upto 250 sites. I have an Adwords campaign where I have over 1000 sites excluded so 250 is a bit stingy. So if you want to collect data for a test campaign, Yahoo is good if you limit to search and exclude spending money on their search partner program. Here’s $25 of free credit to help you get started. Vista is a vicious program that caused me tremendous grief and pain but other than that, I give Microsoft AdCenter a high approval just like XP. It is excellent for the new, super cautious advertiser on a limited budget. The two downsides are lack of market share which means fewer data and a weak content network. But if it’s your first campaign, the content network will provide little value anyway because you have very little control over it. Microsoft is working really hard to attract advertisers and have released some of the best free tools available. My favorite is the Ad-Intelligence Office Excel plug-in and it’s compatible for both 2003 and 2007 version. The free keyword tool is the best of its kind because you access real live data, not cached like all the major tools. Aside from the cool tools, they’re also giving you a generous $75 worth of adcenter ads to get you started. Aaron and I tested Ad Intelligence back in January of this year – here’s our review. Lots of mixed opinions from seasoned advertisers if Adwords is the best traffic source for initial testing. Advertisers in favor of Adwords as the entry point knows that Google delivers some of the highest traffic quality online. Google’s king-size ownership of the market allows advertisers to test campaign performance, keyword efficiency and landing pages with fast, accurate data to influence any changes. You’ll know in a shorter period how your offer will fare. The other team knows Adwords as the most competitive channel on the market. A lot of new advertisers are easily discouraged if they’re not prepared for the fierce competition ahead. Expect incuring higher costs, complete lots of quality score requirements and face that risk of getting slapped around. Again, there isn’t a right or wrong answer and agree with the logic of both sides. If you’re in a competitive market such as insurance, mortgage, male reproductive organ enhancements, payday loans and etc, Yahoo or Microsoft could be a smarter choice because you’ll get the data you need at a fraction of Adword’s budget requirement. If your product is really niched with little traffic and competition, Adsense can be prioritized. This will help you extract data faster, from a very rich source without exhausting your budget. Yeah, do blog about your theory. Yahoo used to be a winner when it came to conversion but I guess they lost that title too. I do know that some advertisers are rooting for Adcenter. My conversions on Yahoo have been SIGNIFICANTLY less than Google. Adcenter is just is a pain to use. I hate waiting a day to find out my stats. Thank you very much for this article I was thinking of posting just this question. I am back reworking what I have done with PPC to promote a newly published website and wanted to get just such an outline of the differences. One thing I found very helpful is the ability to call and ask questions with Microsoft and feed back on what should be done on the account. They clearly are trying to get customers. Yeah MSFT’s customer service is superior but they need to stop attracting advertisers and focus on acquiring a strong search user base. Once they do, advertising dollars will flow almost naturally. I want them to gain market share as it may loosen up Google’s tight grip. However, they have a steep uphill battle. You can combat the increased cost of using Google by including a large list negative keywords. In my mind these are almost as integral a part of your campaign as the keywords themselves. This can help cut down on low quality traffic, subsequently increase ctr, and therefore quality score. With MSN you have a 1,028 character limit for negative keywords. Boo! Initially you can get cheaper clicks, but you can cut down on as much on irrelevant impressions. This makes it hard to optimize your account. That’s why I would go with Google to as a starter. Maybe you lose a little more money on start up, but they have tools available, like the search query report, which help you to develop your keyword list as well as negative keywords. You can make vast improvements to your account much more quickly with the use of these tools, and the increased traffic. Jessica – I agree with you. I’ll cover my experience in Part 2. And yes, I started with Google. I think it is pretty consistent across the board with Google, followed by Yahoo, and then MSN. I personally spend no more than an hour on MSN in a month just because it has no volume. Granted it would depend on the product one is selling as well but for now, MSN is just not worth much time. Google and Yahoo – well Yahoo in my personal experience has a better click to conversion rate as oppose to Google even though Google brings in a lot of volume. I would still say using Google and Yahoo both for your PPC campaigns is a good idea just because they have such different demographics, you will minimize loosing any audience that ways. But yes if you have to choose one over the other, then start with Google and then eventually replicate the account on other engines. Caution: when you replicate make sure you do some research with the CPCs as they tend to vary in price drastically on both engines as well – you don’t want to kill your conversion and at the same time not end up in a situation where your Google’s CPC shoots your budge through the roof on Yahoo. Impressive! A lengthy but useful guidelines on how and what to do in ppc seo.